With the bright band of the Milky Way below the horizon, the depths of intergalactic space rise high in the sky and a myriad of galactic shapes appear. Though most are small and dim, there are many that are worth capturing, and a few a beautiful enough to rival anything else in the sky. May is unquestionably Galaxy Month. The iconic Whirlpool Galaxy, M51, is one of the highlights of May. Its companion (NGC 5195), tugging at one arm, serves only to accentuate M51's beautiful spiral symmetry. In contrast, we see NGC 4565 edge on; not a hint of spiral arms can be detected. Nevertheless, the ragged dust-clouds that cross its needle-shape are beautiful and mysterious. NGC 4565 is one of the brightest galaxies missed by Charles Messier. My personal favorite is the aptly-named Sombrero Galaxy, M104. Many of the astronomy books I read as a kid had pictures of this galaxy, but all showed an overexposed core that made it look like the flying saucer from The Day the Earth Stood Still. The ESO image in 2000 revealed the galaxy in all its glory, and I've been a fan of this galaxy ever since. When I started in astrophotography I naturally gravitated to targets familiar to me from my visual astronomy days: M51, M13, M42, etc. But it turns out that some of the lesser known deep sky objects are actually much more interesting to photograph. 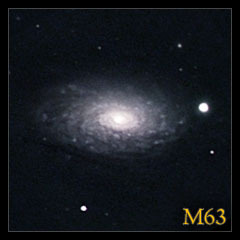 When I first imaged M63 I was surprised at how well the photo captured its intricate pattern of tiny arms. 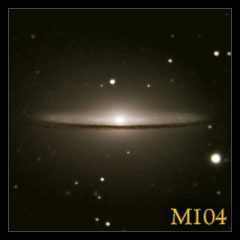 M106 is another great example visible in May. Visually it is no more than a large undifferentiated smudge, but a well-processed image brings out interesting and subtle detail in its squid-shaped form. M64, also known as the Black Eye Galaxy, is justly famous. Use as much resolution as you can to capture the turbulent clouds of dust swirling around its core. M94, another wonderful galaxy in May, needs a lot of exposure time to reveal its faint outer arms. Finally, bright galaxy M83 rivals almost any other galaxy in the sky except for one thing: at -30° declination, it is hard for Northern Hemisphere observers to capture. But for those of you with low latitudes and clear southern skies this is a very rewarding galaxy. If your skills and equipment are up to it, you might pursue more challenging objects in May. The most famous is probably Arp 244, known as The Antennae and spectacularly captured by Hubble. You will need excellent resolution (to capture its detailed heads) and long exposures (to reveal its wispy tails). Another popular target is NGC 4725, a strange spiral in the Coma Berenices constellation that apparently has only one spiral arm. More normal is NGC 4535, a beautiful (though faint) face-on spiral. NGC 5005 is no brighter, but is is more compact, making it easier to capture. Nevertheless, revealing the tight detail around its core requires excellent tracking and processing skills. Of the group, my favorite is probably NGC 4216. Though much smaller than NGC 4565, this edge-on galaxy is a great target, not least because it is flanked by two smaller and fainter edge-on galaxies. Try to capture all three in the same frame.